Warsaw - UEFA's chief refereeing officer Pierluigi Collina on Wednesday said that a Ukraine effort ruled out against England in their final Euro 2012 Group D match for not crossing the goal line should have been given. "The ball crossed the line. That was unfortunate. It would have been better not to have it," Collina told a news conference in the Polish capital, Warsaw, the day after the Group D match in Donetsk that England won 1-0. Collina blamed human error for the call but said two similar decisions in the 24 matches so far played in the tournament - in the Germany-Portugal and Italy-Croatia group matches - had been correct, adding: "The third, unfortunately, was wrong." The incident arose in the 62nd minute of the game with the score at 1-0, when Ukraine's Marko Devic forced England's Joe Hart into a save and the ball looped back over the goalkeeper towards the net. Defender John Terry acrobatically leapt to clear the ball from under the bar. Television replays indicated the ball crossed the line but Hungarian referee Viktor Kassai - advised by an assistant referee on the line - waved play on. England kept their one-goal lead and advanced as group winners to a quarter-final meeting with Italy. Ukraine were eliminated, although a draw would still not have been enough to take them through. Kassai's decision was greeted with dismay in Ukraine on Wednesday, with many claiming the team was denied at least a point. "The result of the match turned on a gross error by the officials who didn't give the Ukrainian goal," Ukraine's Sport-Express newspaper said on its website. "And it all happened with five officials, two of whom were in charge of seeing whether a ball crosses the line." The incident has reopened the debate about the introduction of goal-line technology after a series of high-profile cases where goals were either given or disallowed, including against England in the last World Cup two years ago. FIFA boss Sepp Blatter, who is in favour of technology, wrote on the micro-blogging site Twitter: "After last night's match #GLT (goal-line technology) is no longer an alternative but a necessity." That again put him at odds with his counterpart at European football's governing body UEFA, Michel Platini, who told reporters this week that the five officials currently being used in Euro 2012 were enough to prevent any controversial decisions. 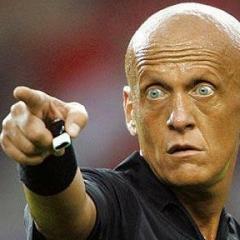 Collina tried to put the Ukraine incident into context, saying that the five officials system had been trialled successfully over "thousands of matches" in European domestic competitions. "This is the only problem we have had," he said. "It's one negative decision in three years of Champions League and two years of Europa League and 24 matches in the Euro," he told reporters. "I would be very happy to know if the same questions would have been asked without yesterday's decision." Collina said the decision was not a reflection on Kassai's overall performance and insisted that officials had a 95.7 percent accuracy rate in calling offside decisions in the group matches. They included a disputed goal by Spain's Jesus Navas in their 1-0 win against Croatia and two Cristiano Ronaldo goals in Portugal's 2-1 win against the Netherlands. But a goal by Greece in their match against the Czech Republic should not have been disallowed for offside, Collina said, again blaming "human error". FIFA is currently trialling two prototypes of goal-line technology, one from British firm HawkEye, which uses a series of cameras in stadium roofs to track the trajectory of the ball and another from German firm GoalRef, which uses sensors. Collina said Hungarian referee Viktor Kassai and his team of assistants would play no further part in the tournament, but no blame was attributed to the referee.